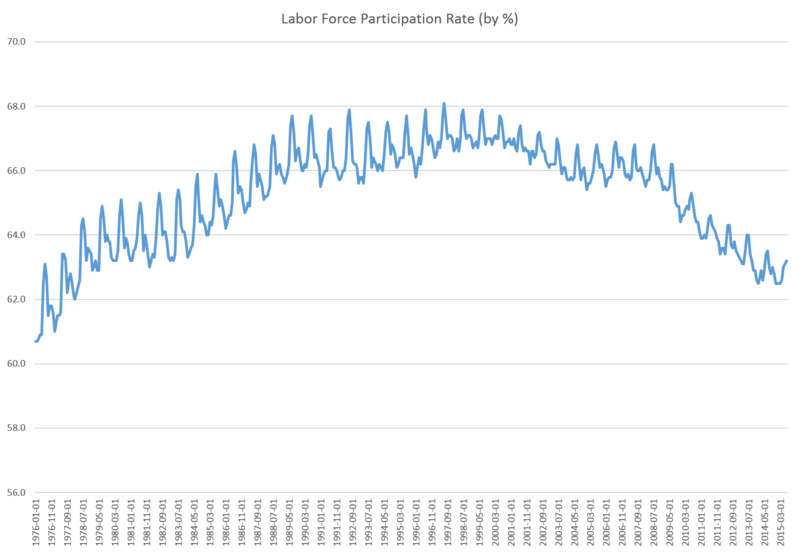 A record 93,770,000 Americans were not in the American labor force last month, and the labor force participation rate remained at 62.6 percent, exactly where it was in June -- a 38-year low, the Labor Department reported on Friday. So, yes, the trend is rather unmistakably upward. The number of people not in the labor force is calculated by comparing the number of people working to the total population over the age of 16. 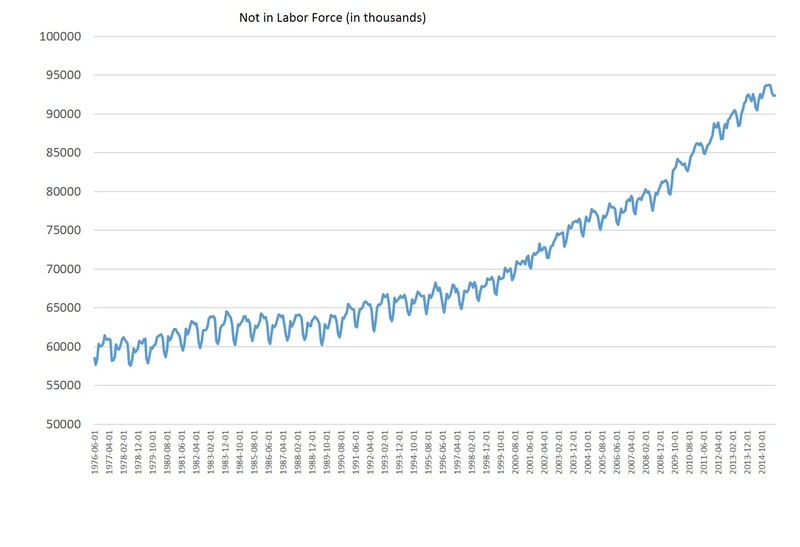 I prefer to use numbers that aren’t seasonally adjusted, so in the NSA numbers, the total number of people not in the labor force in July 2015 was 92,349,000 (slightly different from the CNS number). As of July 2015, the labor force participation rate was 63.2 percent. Again, these are not seasonally adjusted. 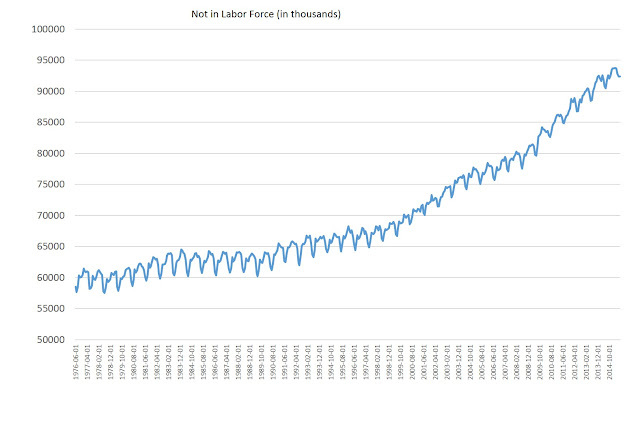 But, just a quick look at the graph tells us that we have to go back to the late 1970s to find similar labor force participation rates. Obviously, there are seasonal cycles in employment, so for the sake of making sound comparisons, we should only compare July’s numbers to previous July numbers, though, so if we look back at the same month in previous years, we find that we have to go back to July 1977 to find a comparable rate. Specifically, in July 1977, the labor participation rate was 63.4 percent. So the CNS article is more or less correct. Labor participation is at a 37 or 38 year low, depending on how you look at it. But what does this mean for the economy? Part of the decline in the labor is simply attributable to the increased number of retirees in the economy. The Chicago Fed claims that “just under half”of the decline in the work force since 1999 can be attributable to demographic trends such as retiring baby boomers. Fair enough. But what about the rest? That’s where discouraged workers come in, who have given up looking for work. The ranks of discouraged workers should also include people who retired earlier than they would have had they been able to hold onto their jobs after 2009. Other phenomena driving an exodus from the work force will be people going back to school in an attempt to get a better job, and also people who used to be wage earners in a two-income household, but now have concluded that wages are no longer high enough to justify the opportunity cost of working. These people may have quit work to offset costs such as child care, which is only worth it if your wages come in well above the cost of daycare. When we consider all of this, there’s good reason to suspect that the job market really is quite lackluster. If wage growth were performing well, people would be enticed back into the labor force, and the participation rate would rise. 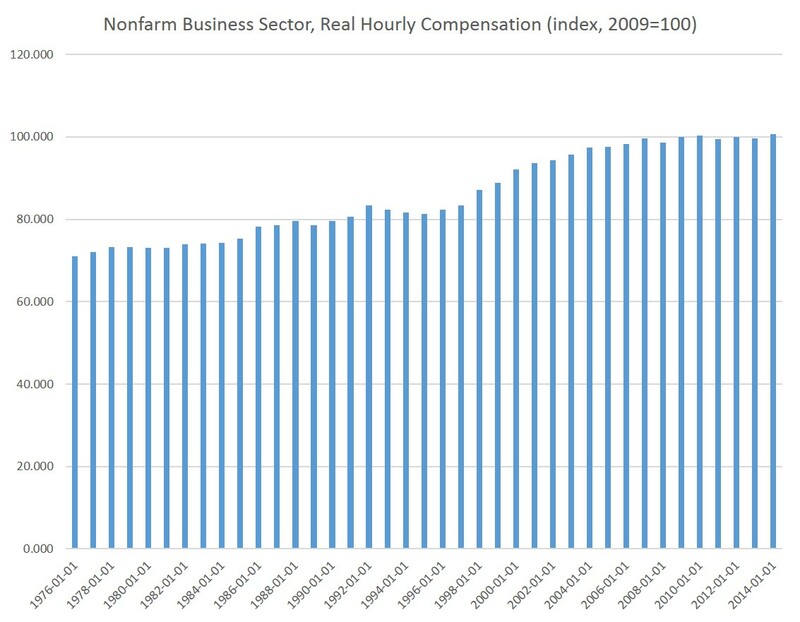 Now, one could make the argument that fewer people need to work because, perhaps, wages are going up. After all, if worker productivity (and thus wages) are going up, then households will not need as many wage earners to maintain an acceptable (to them) standard of living. Theoretically, if the economy were really humming along due to increases in worker productivity, we would also see people leaving the workforce. 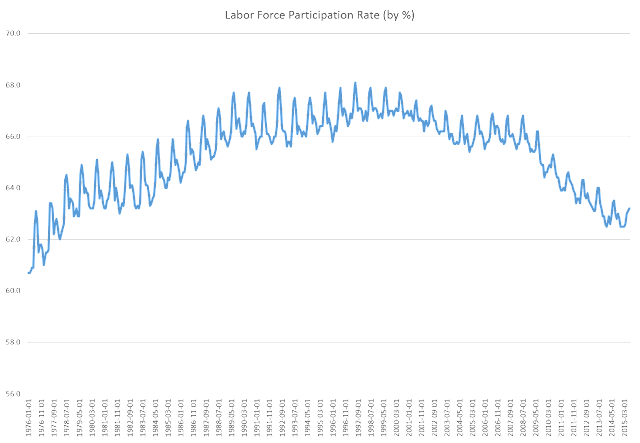 The falling labor participation rate is often mentioned with the assumption that declining labor participation proves that the economy is withering. This is not necessarily true, given that automation can increase worker productivity and thus reduce the need to work as much to achieve what the workers deems to be an acceptable standard of living. Indeed, many urban workers today work fewer hours than urban workers 80 or 90 years ago, and have a much higher standard of living. Also, increases in the labor force during the 70s were partially driven by women entering the labor force in large numbers. But, looking at the past thirty years and at current wage data, we can guess that people are leaving the work force now, not because they are so satisfied with their standard of living, but because they are discouraged workers, have retired earlier than they might have, have gone back to school, or have just resigned themselves and their household to a lower standard of living. 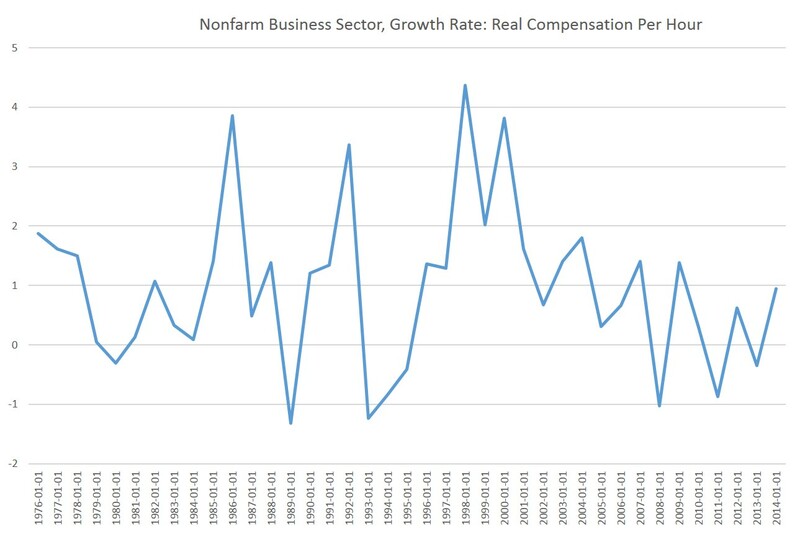 The falling number of workers belies that continued claim in the media and by government press releases that things are getting better and better, and that with just a little more patience, happy days will be here again. Moreover, with a declining work force and flat wages, who's going to finance all those Social Security and Medicare payments that are paid out relentlessly to an increasing retiree population, but financed by a shrinking workforce?